Roll out your own Food Ordering App for your Restaurant or Food Startup at very low cost. DevFood is an integrated online & mobile ordering platform made for Restaurants and Food Startups. 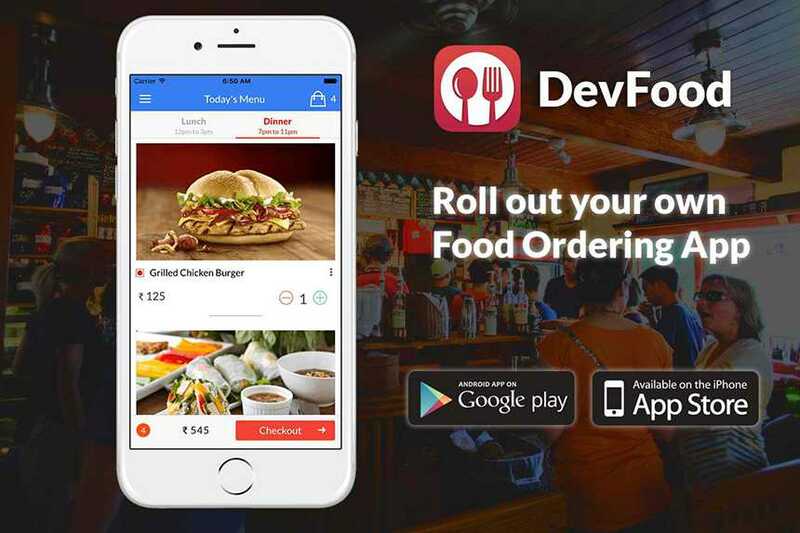 DevFood is a product-startup that enables restaurants and food startups get their business online by providing them a custom Food Ordering Apps (iOS & Android) and Backend Platform. It helps to increase revenue, encourage customer loyalty and improve the overall customer ordering experience. Branded Apps - Modernize your business with your very own iPhone and Android apps. Save money - Save money by paying on a monthly basis and avoid up-front fees. Instant - Have market-ready iOS and Android apps within a week. Authentic user - OTP via SMS makes only genuine user to place order. Push Notification - Engage your most loyal customers with push notifications. Analytics - Keep track of how many people are installing and using your app. The ambiance for a perfect dinning place or cafeteria is set. The menus cards are ready to serve some mouth-watering cuisines and platters. The staff is all dressed-up to take the orders. But, you find a rival restaurant with similar arrangements in the neighborhood attracts more customers. Perhaps, they invested in a mobile app - something almost a necessity for every business to succeed. Still not convinced about the idea? Read the following revelations and then decide. Your restaurant targets customers, most of who carry smart phones and tablets all the time. While searching for new or popular restaurants in the area, they love to view menus and have an idea about layouts, decors and overall atmospheres before settling down on one. The first thing they would expect is to find and install your restaurant app. If you fail to meet their expectations, they would prefer other restaurants with mobile apps. Resultantly, the chance to impress them with the USPs of your business is crushed in the beginning itself. First, it is much more convenient to access an installed app than a bookmarked mobile website. Second, your customers would find it much easier to make instant reservations with the push of a button. Third, you can easily guide the first time visitors to your location by providing GPS-enabled directions. Also, if you offer takeaway and home delivery services, the app would make it easier to place orders faster and without the need of calling or logging on. Once a customer install your app and is satisfied with the food and services from your restaurant, chances are that it would stick to your business for longer. You may further extend their loyalty with loyalty programs that would be much easier to operate using your app already installed in their devices. According to the reports, just about 5% of the restaurants globally have business apps. It means that by having an app for your business, you instantly gain an edge over 95% of the restaurants. And if you invest in a really fantastic app, you would give a tough competition to the rest. The beauty is that even if your restaurant is small or new or not located at a strategic location, it may get into the top league with the help of an impressive mobile app. Push notifications have come up as the most exciting channels of direct marketing (at par with other similar channels like SMS and emails). Reports suggest that more than 70% of mobile users activate push notifications to receive business updates and messages. Location-based marketing is another amazing advantage of mobile apps. With an app, you may easily convey hot deals, coupons, happy hours, events and celebrations and other promotional messages to the customers roaming in your area. Remind them about their bookings and reservations (many of them would appreciate it). Send greetings and wish them on special occasions like their birthdays, anniversaries and during festivals and on important days. Give them a convenient opportunity to offer feedbacks and testimonials or to make complaints (make sure to resolve them immediately). Send images of updated menus, new cuisines and sections added to your restaurant. Inimitable customer care services via click to call and other features supported by mobile apps. Share your restaurant's location, business hours and other facts with their social contacts. Posting images of their dining experience and events attended by them at your place. Recommending your business with positive reviews and testimonials. At the same time, it would allow you to exercise improved customer engagement by sharing your social statuses and updates right away with the app users. Mehul Rajput, CEO of Mindinventory helped Devfood for app marketing. Mobile apps set automatic customer analytics tools that let the business owners keep an eye on customer behavior and customize their products and services accordingly. For example, you app would help you know about different age brackets, genders, budgets, purchase histories and locations your customers belong to. Based on this valuable data, you can market your restaurant's offerings in a much more relevant manner. Imagine a scenario in which the customers place their order via app when starting from home. This would help your staff to reduce the waiting time and serve the customers as soon as they arrive. In case, a customer is trapped in traffic on the way, he or she can inform the same using the app and the staff would manage the time accordingly. In short, it would bring in greater efficiency in your business operations. Branding: An app would establish you as a good brand in sync with modern times. Sales: More customers would mean more sales and better profits. Customer Satisfaction: What could be more enchanting than having satisfied customers? While these are just the top reasons, you would discover many more in the process of getting an app developed. It is your opportunity to make your restaurant a success and you must grab it with both hands.